The ShiLang is nearing completion. 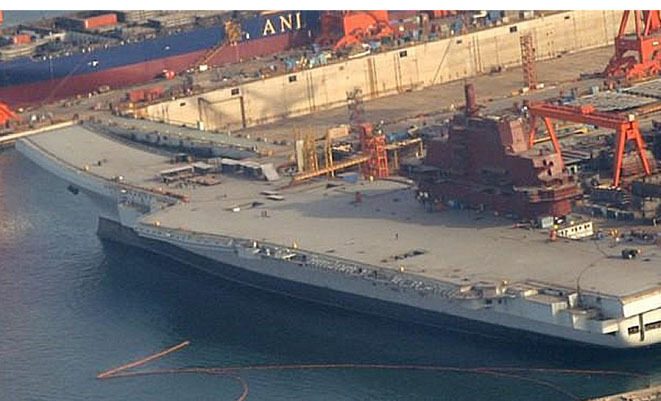 China’s new 300m long ex-Soviet aircraft carrier is nearing completion,with top People’s Liberation Army (PLA) officials now confirming the existence of the ship. The new carrier, now known as the ShiLang, is the ex Varyag, which was bought from a Ukrainian shipyard in 1998. The Varyag had been under construction in the Ukraine in the 1980s for the Soviet navy, before the collapse of the Soviet Union in 1991 left it surplus to requirements and only 70 per cent complete. China has since spent more than a decade refurbishing the carrier, which is currently alongside in the northeast port of Dalian. PLA General Staff head General Chen Bingde admitted the ShiLang was under refurbishment to a Hong Kong newspaper, but refused to say when the carrier would be completed. It is expected that the ship will be used as a training vessel for PLA-N pilots and sailors to become familiarised with carrier aircraft operations at sea. China has since denied that the aircraft carrier poses any threat to surrounding nations, with assistant chief of General Staff Lt Gen Qi Jianguo confirming in the same newspaper that the ship would “definitely not sail to other countries’ territorial waters”. WWIII won’t be too far off. With the collapse of the financial system and hyper-inflation, war will seem like a great idea. This will be instigated by the NWO and they will try to create a world government when the dust settles. Very interesting name, there seems to be a lot of history behind it… or maybe im imagining it? Well it is only one carrier – and one that is limited in capabilities compared to a supercarrier like the US operates. It probably isn’t a strategic issue now, but over the next few decades China will probably build more capable vessels. Carriers are easy to track via satellites, so we wont have any real surprises, and as this carrier only has a jump ramp it means that it will be operating Chinese pirate-Sukhois when the US will be fielding stealth aircraft from their carriers. Australia played a part in this. We sold HMAS Melbourne to China for scrapping and scrapping was put off for several years while the Chinese “studied” it. Some belive they didn’t scrap Melbourne until 2002 and some beleive it was even later than that. I live in China & I can tell you that there is a big push on for aircraft carriers here. The public want them & so does the government. They will fly Sukhois from them & China wants to show it’s “power” to the world. The US will field stealth aircraft but the Chinese have been developing stealth technology. @ James. Have you got your shelter packed and ready for the apocalypse? If you haven’t it is surely too late, as the collapse of the financial system means the banks have all closed and hyper-inflation has now put the price of bottled water and tinned food out of reach of ordinary people. There’s not much time left, 2012 is just around the corner. If you didn’t enclose yourself in a concrete sarcophagus in 2009, you’re as good as dead already. @ Burcho. If they spent so long “studying” Melbourne then they must now be experts in 1940’s carrier technology! Obsolete in 1985 is still obsolete in 2002 and 2020. “Some believe” in the Loch Ness Monster, and “some believe” that aliens are coming to take us all away to their utopian home planet. Also, “some believe” the New World Order is awaiting to pounce in order to establish WG. What “some believe” would fill Wikipedia. In fact it does. Are you seeing the pattern yet? The Soviets feared the West and its insane rhetoric of “evil empire” and escalating and threatening military power, and the West feared the Soviet Union and its alien political and economic system (at least to Americans) and whose military was rapidly following up behind. A destructive little cycle that resulted in Korea, Vietnam, Afghanistan (1979) and a hundred other filthy little wars fought for no purpose. And yet here we are starting the cycle all over again, only this time with a giant that can afford to play the game and win. China has a certain expectation of their place in the world. They feel the US is attempting to relegate it to a meek observer in order to reinforce US dominance of global affairs (probably rightly). They believe that their economic and social power gives it a voice and rights that are being ignored, and that military power is a part of this assertion of Chinese needs. The likelyhood of a war with China is remote, and a nuclear exchange even more so. Why? The economies of the US and China is so intertwined and dependent on each other that a war would be an economic disaster. China basically owns most of the debt of the United States. Do you think the US would default on their debt responsibilities? The Chinese government and people aren’t insane. Far more likely is that the Chinese would use their economic power as a weapon to get what they want. The answer to this increasing confrontation with Chinese influence is not a spiralling military build-up, nor a diplomatic confrontation, nor a series of self-destructive verbal point-scoring. It is to treat China like grown-up equal. Yes, it is that simple! Stop the berating, chastising and scolding, invite China to participate more in international affairs (especially where Chinese and Western interests coincide), change the our posture and rhetoric away from antagonism and confrontation, and stop demonising and being hypocritical (such as condemning China’s influence on developing nations while peddling our own). China shouldn’t be a mystery. Germany, Japan and Russia (in turn) have shown us that it is politics that divide us. They have the same needs that Australia has. Bob – one big difference. The USA is democratic, the leader of the free world, and a champion of human rights and dignity. China is a communist, totalitarian regime that supresses its citizens. Don’t ever forget this one key difference.